I did this ride with my pal David. We were to ride inbound to Petersburg from the east, passing the plantation houses along the James River. You can really feel the burden of history here, it almost feels like too much. There are historic signs not only about the Civil War, but of the initial Jamestown settlers, the revolutionary war, and the War of 1812. I would have trouble focusing on the present with so many reminders of the past. I speculate that Petersburg has more pre civil war buildings than the entire state of North Carolina. The area is extensive! The historic area covers an area almost a mile square. Close to downtown, there are brick row houses, clearly built in the eigththeen twenties or thirties, like ones you would see in New York’s Greenwich Village or the Julia Street area of New Orleans. There are simple two story wooden houses, four windows with open shutters up and four windows down, like you would see in any subdivision. Except that these houses were built before 1800. The subdivision houses are modeled on houses like this. There are Italianate houses clearly built for the managerial class. In a very Southern way, on side streets near the large houses, are equally old small houses, clearly built for the servants, dare I say the slaves? There are large factory buildings, brick, three to five stories tall. There is a whole area around Petersburg’s Central Park, formerly called Poplar Lawn. Old houses, late nineteenth century, front a large park about the size of four city blocks. And all this has problems. 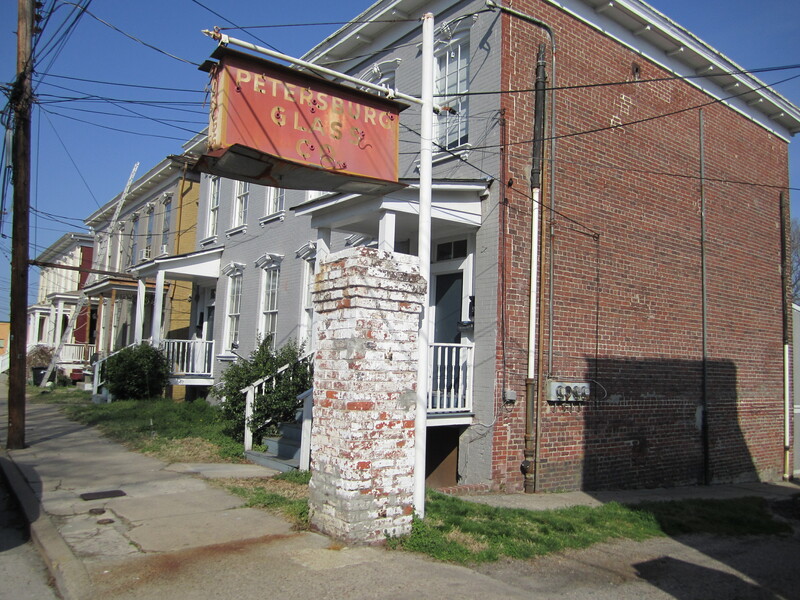 I have been going to Petersburg now for almost twenty years, and it is moving forward. But it is a slog. Abandoned buildings are everywhere. Beautiful abandoned buildings. Much of this is due to white flight. Even those who live and work in the historic area have trouble not talking about things in racial terms. Starting especially in the nineteen fifties, whites moved a half mile across the river into the suburb of Colonial Heights. 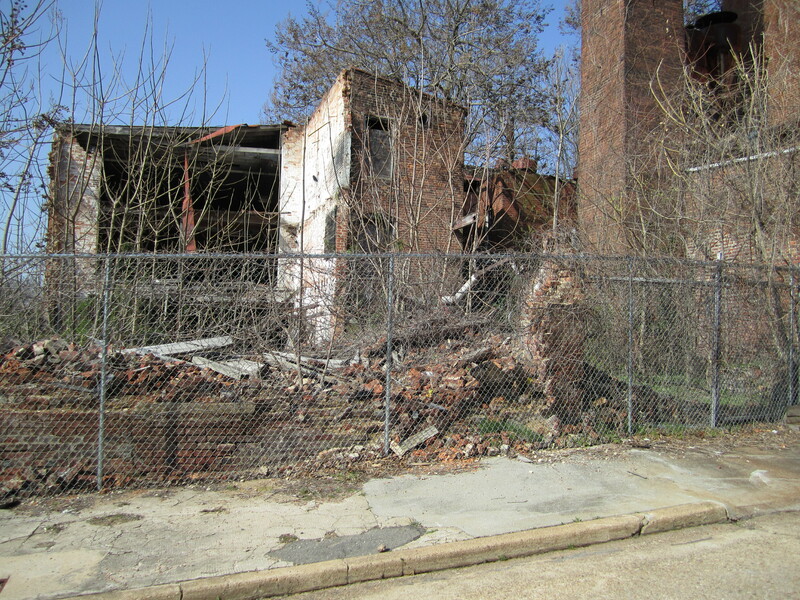 Even the suburbs of Petersburg are not wealthy. Fort Lee, the large military base, is right outside town. You cannot fault too much poor black folks and enlisted military for not getting too excited about historic preservation. Dave was sleeping late on Sunday. I first took a ride around town; circling through the neighborhoods. It never felt unsafe, but I always stopped before I got into completely poor black neighborhoods. I needed two things. I needed a toothbrush. I needed two 700 by 25 mm, presta valve tubes. Maybe I did not know where to look, but in the entire downtown and surrounding area, there are no grocery stores and no drug stores. I finally found (open!) a Family Dollar, a store that caters to the poor. I bought a toothbrush and rode back to the B & B. My Android phone with Google is a great tool. While a bike shop was a long way away, there was a Wal-Mart only 1.2 miles away. I could not believe such luck! A 1.2 mile ride across the Appomatox river into Colonial Heights shows why there is nothing to buy in Petersburg. There is not only a Wal-Mart, there is a Target , there is a Super K-Mart. There are all the chain restaurants. It is a different city and a different tax base. I found the needed tubes and rode back to the B & B. The whole round trip including shopping took less than half an hour. But these stores in Colonial Heights, right off the freeway, have sucked the economic life out of Petersburg. I fixed the flat tire and we rode on.